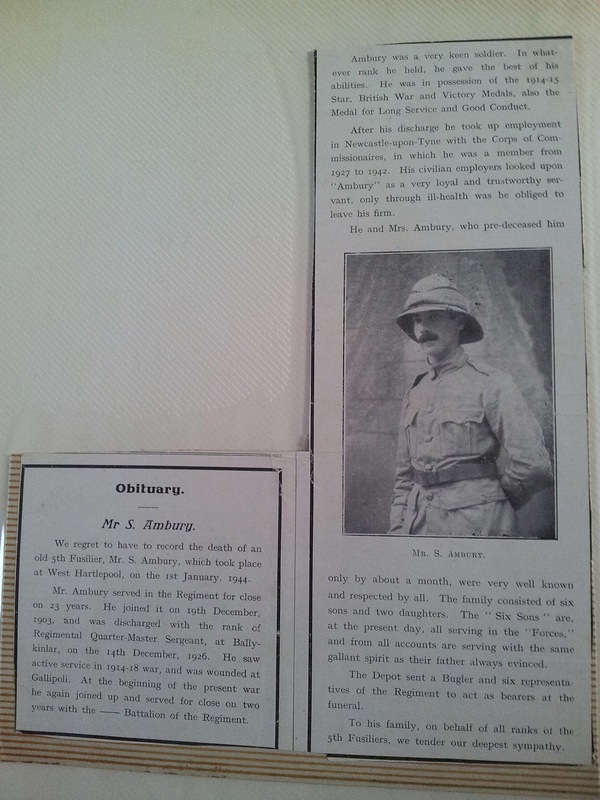 I’ve found this letter about my great grandfather Sydney Ambury’s (1885-1944) army service record and his obituary. I’d love to understand more about what he did and what it meant. If you can help at all please comment below. I only discovered a few years ago that Sydney was born Solomon Benjamin Hamburg in Spitalfields the 8th child of Dutch Jewish parents Benjamin Hamburg and Flora Salomon Rina. Previous to then I and the rest of my family had no idea that he was Jewish or that he came from London. At 17 Sydney enlisted in the army in Hounslow and at 18 started serving in the British Army in Newcastle. I would love to know anything that anyone can shed light on in terms of my family history and his military service. You can probably now get his full service details from MOD, which will give more context and medical info. However, even with that you’ll get a fuller picture of what he did in the First World War by finding his battalion war diary at The National Archives, in record series WO 95. All those for units on the Western Front have now been digitised and so can be downloaded from http://discovery.nationalarchives.gov.uk for a small fee. Putting WO 95 “Northumberland fusiliers” and the battalion number into the search should bring the relevant diaries (use 1, 2, 3, etc rather than 1st, 2nd, 3rd etc, sometimes doing eg “1 battalion” might help). Even if the diary hasn’t been digitised you will get a catalogue description (diaries for units in Gallipoli can be found on ancestry.co.uk). War diaries were also kept in the Second World War, but none are digitised, and I don’t know off the top of my head if the POW units did keep them. For material that’s not been digitised you’ll need to make a visit to Kew (or order copies/hire a researcher). Sue, I haven’t the records background of David, but do have the Army background, and can probably help with interpreting any diaries you do find. From the depot he was posted to the British West Indies Regiment in January 1916 ((see http://www.longlongtrail.co.uk/army/regiments-and-corps/the-british-infantry-regiments-of-1914-1918/british-west-indies-regiment/ for a little more background). Due to official attitudes regarding black soldiers at the time, the battalions of the British West Indies Regiment (BWIR) were largely employed on labouring and other non-frontline tasks. This suggests he probably hadn’t reached full fitness. The war diary for the period he was with them (and up to June 1919) can be found (and downloaded) at WO 95/338/1 Army Troops. 3 Battalion British West Indies Regiment. He was promoted to regimental quartermaster serjeant in February 1916 (the second most senior non commissioned officer – or strictly warrant officer) in a battalion. He was transferred to 5 Battalion BWIR in August 1916. 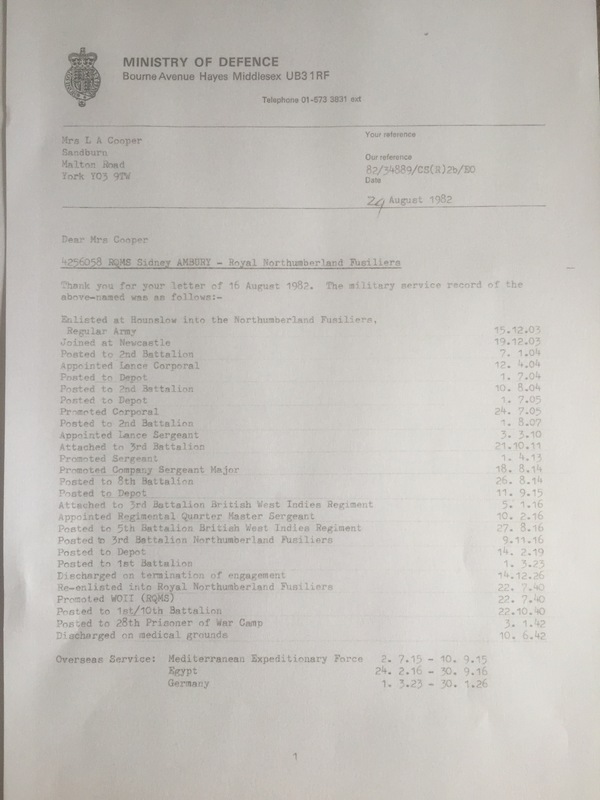 That battalion was in the middle east, the war diary is in WO 95/4465 5 Battalion British West Indies Regiment but is not (yet) digitised, so as I mentioned above it can only be seen in person in Kew (or order copies etc). Then in November 1916 he was posted back to 3 Battalion, Northumberland Fusiliers, and remained with them for the rest of the war. This was the special reserve battalion, and in war time functioned in a dial role of training and home defence, it never left the UK, and appears to have been in Sunderland at this time. Home units didn’t usually keep war diaries. To fill in details of where he would have been serving before and after the First World War you could try to find published histories of the regiment, and I believe there was a regimental journal, St George’s Gazette, but I’m not sure how easy it is to obtain. Probably easiest to speak to the regimental museum, the journal might also be in the British Library.